You. Me. Ride This Crazy Train - Adventures and Observations on The GO: You tell me what's worse? This woman acting like she's on her patio or her unshaven legs? It's not something I would do (the hair, I mean). Imagine what else is left unshaven. What happened to personal hygiene? I know it is hot as hades out there, but still a little personal grooming is a good thing. That and maybe be considerate of others and re-apply the pit stick before heading home. Probably one of those 'cultures, where women have under arm hair too. Eww, if that lady doesn't want to shave fine but wear some damn pants. Hair, really? I don't see any. There is some discoloration on her skin, but that isn't hair. Even if she did have leg hair, who cares. 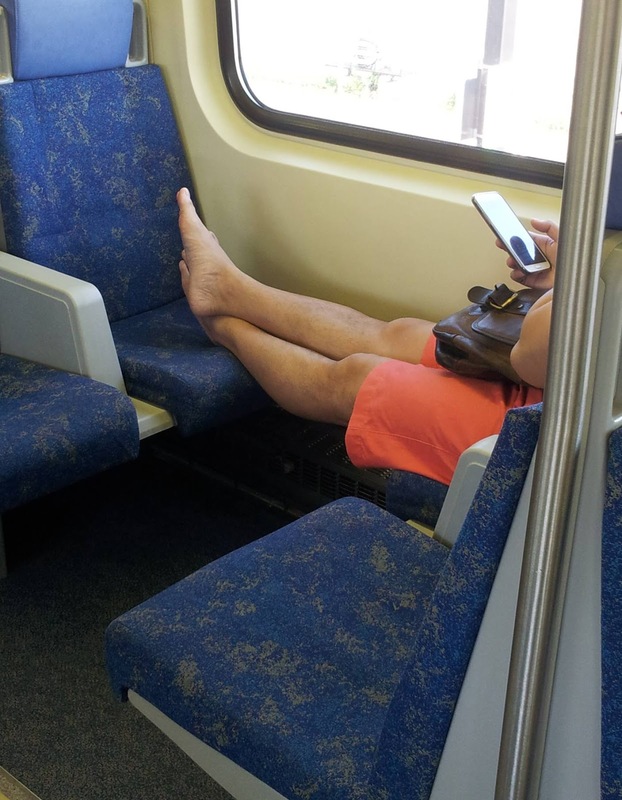 She has her feet up, is using a Samdung phone, and is wearing orange shorts that don't match her purse. We should be making fun of her for using a Samdung phone, not because she has some hair on her big toe. Just realized this photo doesn't zoom but anyhoo, there was hair and a lot of it. God love her for it but the feet I can't forgive. The train is not her living room.